Yesterday, my parents and I had the blessing to visit Rev. 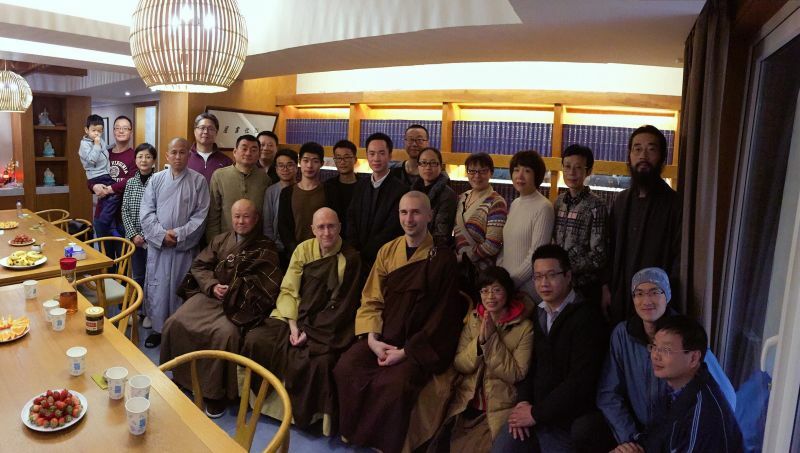 Heng Sure and the team from Dharma Realm Buddhist Association, in the ancient city of culture and abundance, Hangzhou. Dear friend and ServiceSpace summer intern Sophie told me about Rev. Heng Sure's visit to China a few weeks back. When I shared the news with my parents, they both feel moved to visit the beloved teacher, yet couldn't pinpoint any concrete motives :) They are just happy to have the opportunity to be in the presence of the noble sangha and community, pay our gratitude and respect, and be of service if any opportunity arises. With that intention, we drove for 4 hours to Hangzhou, and got to spend a precious 6 hours with the wonderful community. It was a day when the Dharma came alive, the community came together, and life came full circle. Rev. 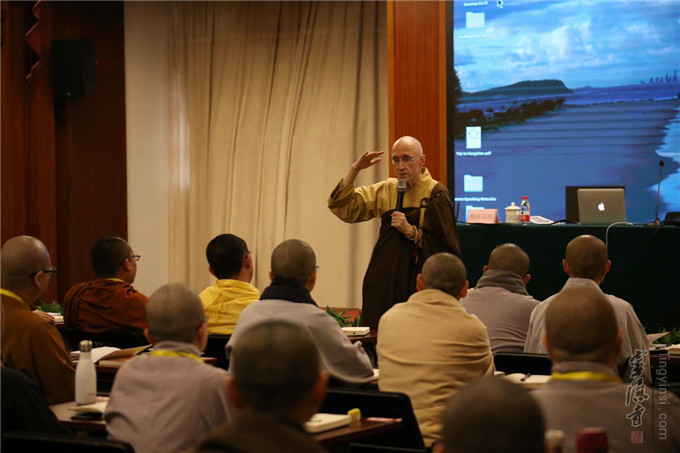 Heng Sure and team were in town to give a week-long training on "speaking the Dharma" to a group of 50 young monks and nuns selected from all over China for their talent/volition to teach Dharma in the global era, especially in English. The auspicious gathering was held in the 1,700-year-old Ling Yin Temple. Rev. Heng Sure, with support from Jin Wei Shr from Poland, were the main teacher (and the only Western monks) to teach the elite cohort. For a whole week, Rev. Heng Sure lectured for six hours every day, half in Mandarin and half in English. 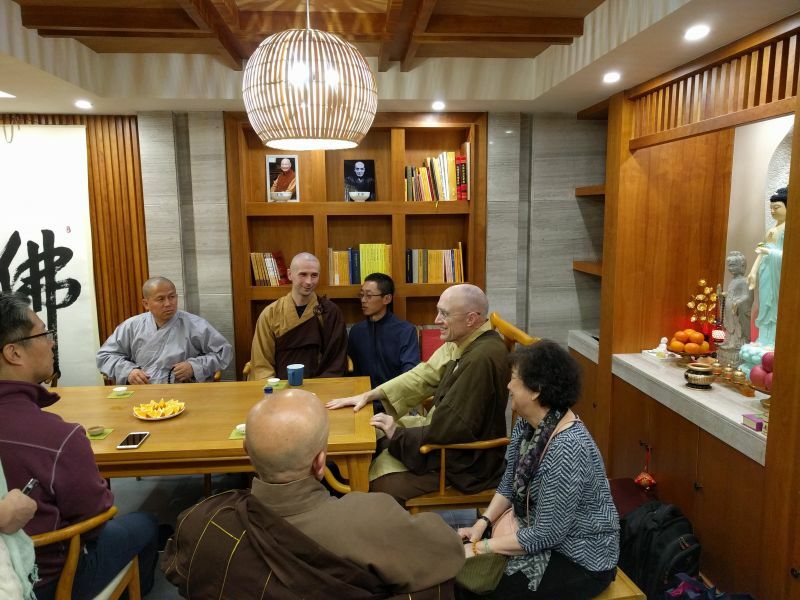 We arrived to chance upon a circle of sharing with key volunteers working to spread Dharma in contemporary China. The 4-hour meeting offered a most hopeful view into the "state of the union" of Dharma in China. The tech team manages half a dozen "Twitter-like" online account sharing the teachings of Master Hua. They have also made a dedicated App and website to make it easy to study the sutras in Mandarin. There are also tens of thousands of people signed up online to collectively recite the Shurangama Mantra and the Great Compassion Mantra for ten million times, dedicating the merits toward world peace. (The one-year goal is on track to be reached half a year ahead of schedule.) Across all platforms, Master Hua's teachings and articles receive over 5.6 million hits each month in mainland China alone. And this is just the beginning, with a small volunteer team of all young people. 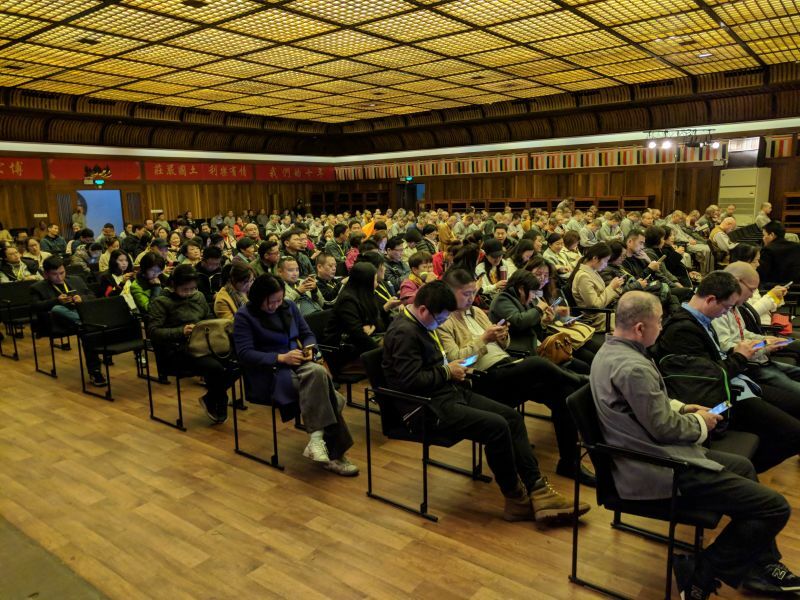 The educators reported on the inspiring results of the K-12 education system based on virtues and situated within the City of Ten Thousand Buddhas (CTTB). Not only do the schools' graduates go on to achieve academic and career success, the parents are even more touched to see their children become steadfast in morality and character. Even the local education and municipal officials in Ukiah, CA, are sending their own children to the CTTB schools. More and more Chinese parents want their children to enroll in the Instilling Goodness & Developing Virtue Schools at CTTB, and there is strong eagerness to bring such education to China. The other good news is that Dharma Realm Buddhist University, the liberal arts college in CTTB, has received full accreditation this month, right in time for Master Hua's 100th Anniversary. Rev. Heng Sure recalled that Master Hua said early on, "So long as education is flourishing, Dharma will flourish. Vice versa." The publishing team is ever surprised by the insatiable demand for Dharma books and sutra commentaries by Master Hua. It took a Herculean effort over many years to get the Dharma books published in mainland. 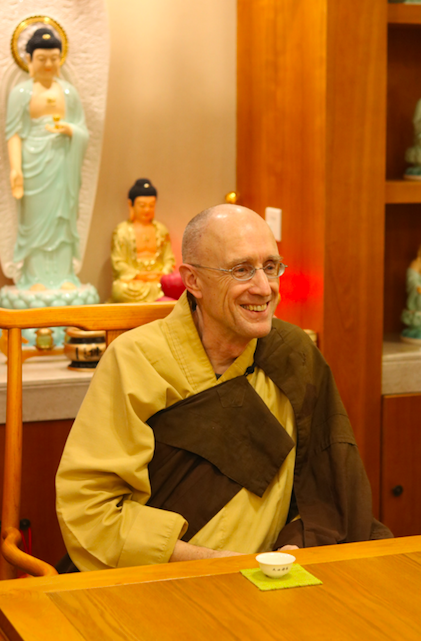 Master Hua's accessible and timeless teachings have brought generations of seekers onto the path of wisdom, some of whom are now abbots of leading monasteries and Buddhist Seminaries. 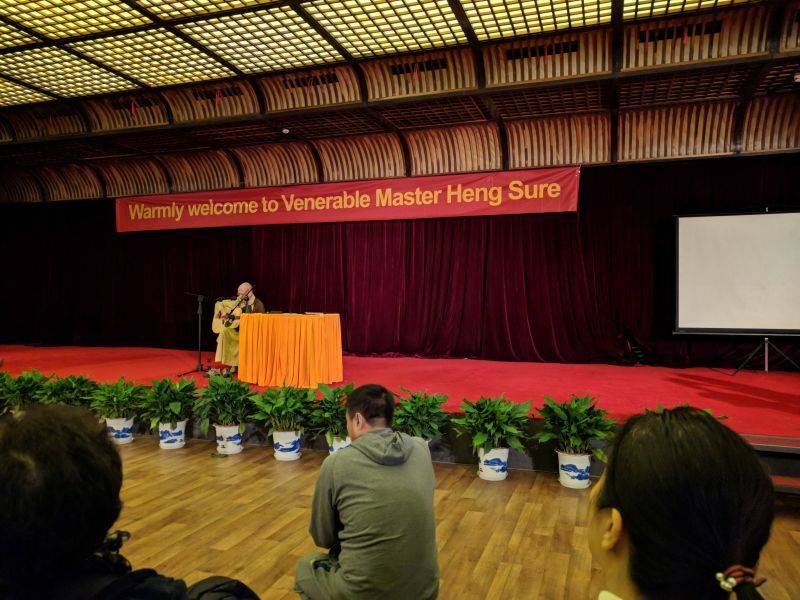 The interest in Master Hua's teachings is a reflection of an overall spiritual awakening in China; and what we are seeing in China is a part of a planetary trend. Most of the volunteers we met are young people under forty. They are increasingly turning inward to find truth within their own hearts and heritages. Rev. Heng Sure and Jin Wei Shr both remarked on how moved they are by the sincere and passionate search for truth within the young generation in China. At a time of global disarray of the existing systems, it is these unreported revolutions on the edges that give us unending hope. As soon as Rev. 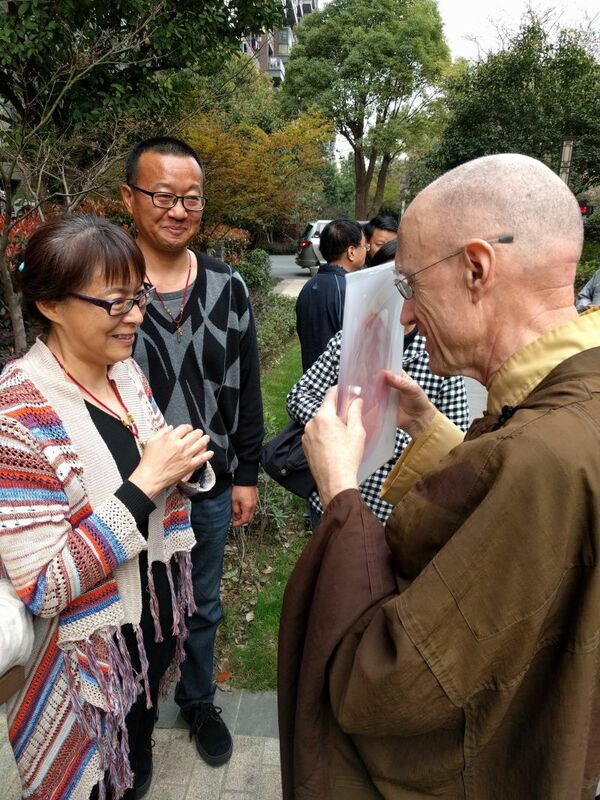 Heng Sure saw my parents, he took such gracious care to engage them, and shared the moving story of his own mother's response to her son's becoming a monk. Rev. Heng Sure went on to share at length with the whole China crew about ServiceSpace, including stories from Awakin Circle and Karma Kitchen recently in Poland! "Truly walking the Bodhisattva path without speaking a word of religion." My parents listened to the 4-hour circle and the 2-hour lecture with great interests, and could not stop talking about the whole experience on our long drive back. They are deeply moved by how Rev. Heng Sure brings together East and West, spiritual cultivation and worldly skillfulness, and wisdom and humor, not to mention American folk guitar and songs :) . My mom gifted Rev. 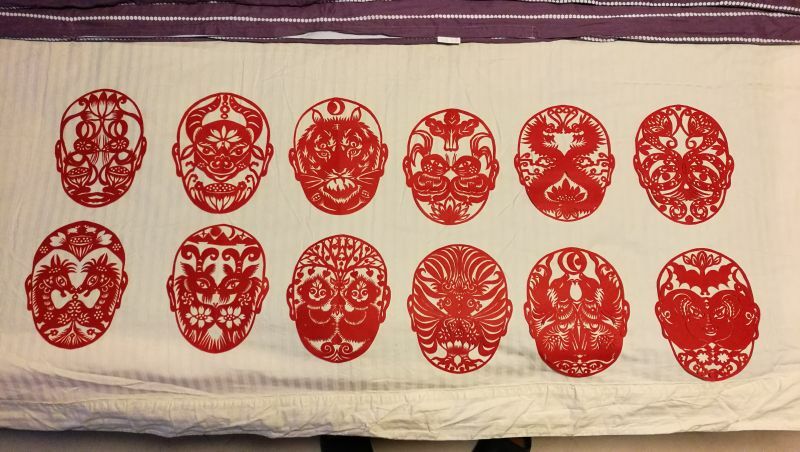 Heng Sure a paper-cut set of "12 animal-year (Chinese zodiac) Peking opera mask with lotus motif", designed and made by herself, as a humble offering to "adorn the pure land". At one point during our drive home, as the Shurangama Mantra was playing in the background, my mom said matter-of-factly, "I would like to go volunteer at the City of Ten Thousand Buddhas for a few months". (She has never been to the US, and speaks little English.) My dad agreed without hesitation, "Good idea. Let's do it." They said it as nonchalantly as if they were discussing dinner menu. I felt I was somehow supposed to be surprised, but I was not :) . It would have been a big family decision to relocate to foreign country for half a year, but it felt most natural to all of us. There's still a lot of logistics-related uncertainty, but the intention and collective agreement is beyond doubt. I am reminded of a conversation with my grandma a few weeks ago. I only recently learned that her mother is a devout Buddhist, and took my grandma to pray at many temples when she was young. My great grandma held Ling Yin Temple in high regard. One year, they couldn't visit the Temple for some reason. She comforted my grandma, "It is the Temple in your heart that is real. You can visit it at any time." So, in ways deeper than I could fathom, life comes full circle, again and again. There is only boundless joy and gratitude in all our hearts :) . Such a beautiful account -- many thanks for sharing. And what gorgeous masks those are -- your mother is truly a gem. Especially enjoyed your account of how your parent's decision to volunteer in CTTB sounded like a casual dinner menu discussion :D Thank you for these stores that prop my faith back where it belongs! Such a beautiful share Zilong, what a blessing to have your parents meet one of your biggest sources of inspiration on your own journey. And it sounds like the ripples from the gathering took no time to swing into motion - wow, spending a few months together volunteering at CTTB! ❤️"It is the Temple in your heart that is real. You can visit it at any time." ❤️ So beautiful.